Available for Dodge, Ford, GM, and Toyota Tundra pickups, our toolbox and fuel tank systems are available in 30, 40, and 50 gallons! They're the all-in-one auxiliary fuel tank and storage box! The toolbox and fuel tank combos come with all components needed for installation (some Ford and GM vehicles require a fillneck adapter kit. See below for information). Our toolbox and fuel tank combos should not interfere with most standard in-bed hitches. Riser kit - rises toolbox tanks 3 5/8" so you can store items under the tank! Refueling Conversion Kit - This kit allows you to pump fuel from our Express-UFS toolbox tank to fill equipment such as ATVs, generators, etc., with fuel. So now you'll have a toolbox auxiliary tank/refueling tank system on your pickup! Locking gas cap - keeps your fuel safe and secure. Available for our aluminum diamond plate tanks only. The fuel systems are available with our patented TRAX-II™ operating system, and come in bright aluminum diamond plate or powder coated black aluminized steel. The fuel tank, constructed of 14-gauge aluminized steel for superior strength and rust resistance, is mounted inside the shell of the 1/8" bright aluminum diamond plate toolbox. 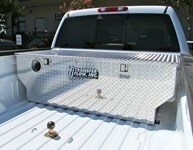 The fuel fill access is located on the driver's side of the pickup on the front of the toolbox. The locking paddle handles keeps your belongings safe and secure. Available in 30 and 50 gallon units. The 30 gallon unit has a storage space of 5 1/2 cubic feet, while the 50 gallon unit has a whopping 9 cubic feet of storage space! Available in 30 and 40 gallons, the toolbox and fuel tank is made from 14-gauge aluminized steel for superior strength and rust resistance, and is baffled in two places on all four sides. It is powder coated black for a durable finish. The fillneck is located within the locking storage department. The tank is about flush with most bed rails. The 30 gallon units has 5.1 cubic feet of storage space, while the 40 gallon units has 6 cubic feet of storage space!